I love containers! I don’t know what it is about them, it just always makes me feel good to know that something has a place. When I began doing My Obstacle Courses with Andrew, I began collecting inexpensive containers (paper or plastic cups included!) that went along with themes that would not only help me create a fun, colorful adventure but also really helps me with organization and Obstacle Course set up. 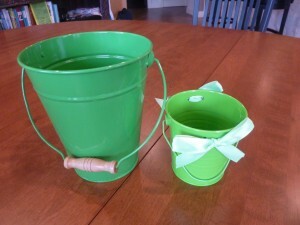 I found these spring colored pails at Target and thought they were so cute but in all honesty, at first I said to myself,”Well, he doesn’t like to dig in the sand or dirt. That’s really too bad!” But then as I took another look at them, I realized that I could use them in so many other ways with him; ways that had nothing to do with things that are messy! So now, I notice things at stores that I would never have noticed before, and think about all of the possible new uses for basic things. 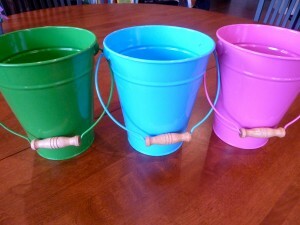 These pails are not only bright and spring-y, they are perfect for sorting into or holding larger items like blocks or Duplos at a station. 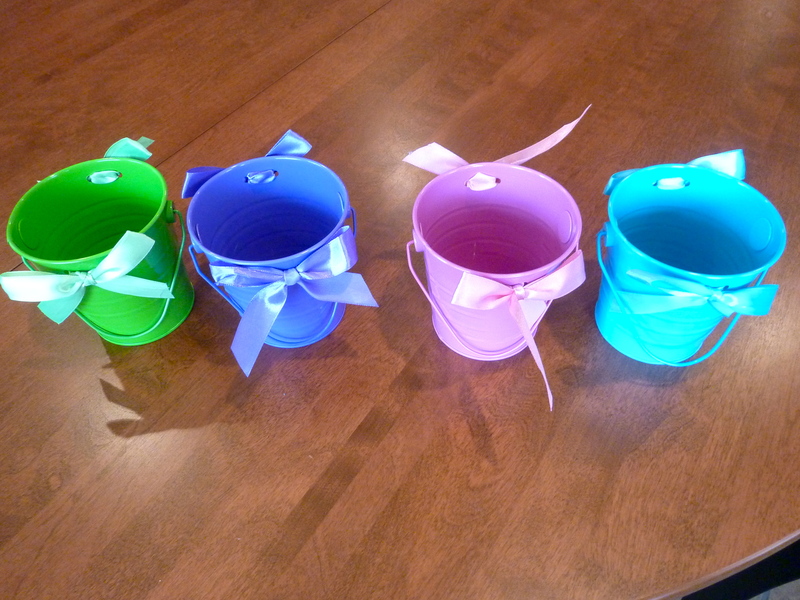 These smaller containers (you could take the ribbons off if you like) would be great for holding materials like question strips or story sequencing cards, as well as being used for sorting colored puffs or math facts written on calendar cutouts. 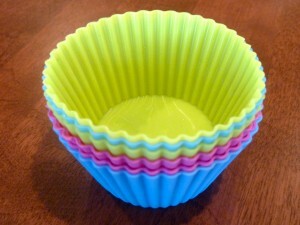 I also found these muffin cups (and if you’ve been following my blog, you know that I don’t bake 🙂 ) and immediately thought would be great for holding small items like colored marshmallows before sorting or graphing or could contain coins that are waiting to be counted. They are great because they are durable, reusable, and can be squeezed to help pour things into one’s hand or onto a work surface. These could also be combined with frosting and a cake decorating kit to build hand strength by having your child fill them with frosting to make pretend cupcakes (Just thought of that as I’m writing and am definitely using that with Andrew this year!). While this particular post does not give specific activities to use with these adorable containers, keep checking back because the posts I have planned for the next few weeks will show how I have used them in the past, as well as how I’m planning to use them this spring, to build literacy, math and motor skills!